More than 1,500 indigenous trees and shrubs have been planted and tree guards placed around the larger plants to protect them from deer and rabbits at Seacombe Landing. These restoration works have been funded by the Victorian State Government through the Gippsland Lakes Coordinating Committee (GLCC). The works are part of a suite of new projects to be undertaken by the Gunaikurnai Land and Waters Aboriginal Corporation (GLaWAC) to protect and enhance the significant vegetation and wildlife that exist in and around the Gippsland Lakes, the country of the Gunaikurnai. This site adjoins part of the Gippsland Lakes Coastal Park and addresses the only significant area of cleared fringing habitat along the straits which link Lake Wellington to Lake Victoria. GLaWAC’s GLCC Project Coordinator, Andy Booth said the team has been working with Wellington Shire Council to repair, strengthen and protect the habitat at Seacombe Landing. “Our NRM crew led by Nigel Pearce, has been watering the plants weekly due to the dry season and making sure that the weeds are kept under control. A fence has also been installed to protect the waterside vegetation from vehicles and foot traffic. “The next steps are to install bollards around the boat ramp to stop people parking there and vehicles compacting the soil. Signs will also be designed and installed to highlight the cultural importance of the land and waters around Seacombe Landing and McLennan Strait to the Gunaikurnai people. This is one of a suite of projects, coordinated by Andy Booth who has been appointed by GLaWAC to manage several projects funded by the Victorian State Government. Andy understands the importance of involving Gunaikurnai community in managing their country. He has a wealth of environmental project experience in Gippsland, around Australia, and also in his home country, Ireland. “I truly understand the responsibility that is placed upon me taking on this role. 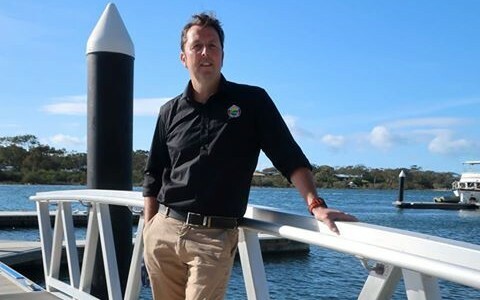 The Gippsland Lakes are an integral part of Gunaikurnai culture, and I am determined to protect the cultural heritage of the Gippsland Lakes and help make the lakes healthier,” said Andy.